Colorado Gov. John Hickenlooper gives a thumbs-up after delivering his first State of the State address Thursday at the Capitol in Denver. At left, Senate President Brandon Shaffer, D-Longmont, applauds. Colorado Gov. John Hickenlooper, center, bows to applauding members of the House and Senate after his first State of the State address Thursday at the Capitol in Denver. Pictured in the background are House Speaker Frank McNulty, R-Highlands Ranch, left, and Senate President Brandon Shaffer, D-Longmont. DENVER – Gov. 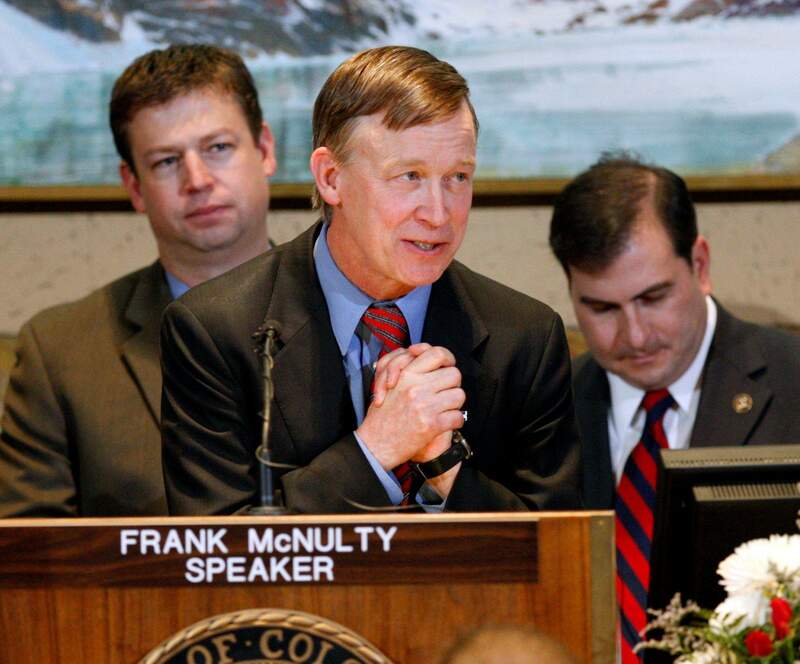 John Hickenlooper had something for everyone Thursday in his first State of the State address. The new Democratic governor at times sounded like a Republican, calling for a “regulatory impact statement” on bills to keep the Legislature from bothering businesses with more paperwork. At other times, though, he had Democrats cheering by pledging to defend two of former Gov. Bill Ritter’s proudest accomplishments – the conversion of coal power plants to natural gas and the expansion of government-provided health care for low-income families. But, befitting the bipartisan tone Hickenlooper tried to strike in his first address to the Legislature, he received the loudest ovation from both sides of the aisle for his challenge to legislators to cooperate. “A lot of people don’t think the state can operate in a nonpartisan way for the benefit of Colorado. We don’t agree,” he said. The line brought legislators to their feet for the first time in the 25-minute address. The State of the State traditionally serves as the governor’s wish list for the next year, and people were anticipating Hickenlooper’s speech because he had not revealed a detailed agenda. On Tuesday, he did share a short wish list, including the creation of competitive Congressional districts and a new “regulatory impact statement” for bills in the Legislature to show their effect on business. Republicans especially cheered the last idea, which they have been pushing for years. “I was very impressed by his speech. I think he gets it. He’s one of the few who understands the nature of the problem facing our state,” said House Majority Leader Amy Stephens, R-Monument. 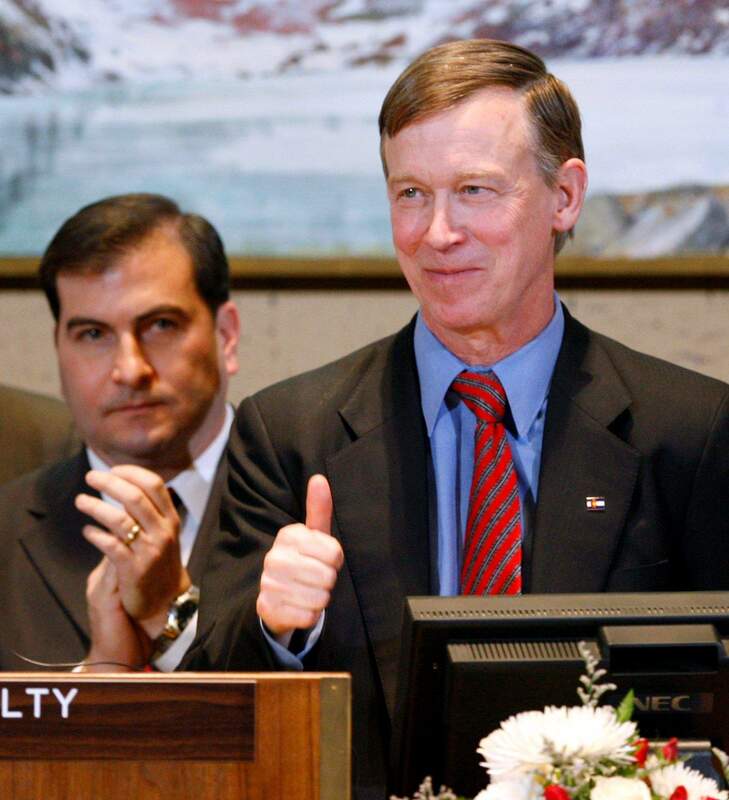 Hickenlooper supplied only scant details about how the regulatory statement might work. In a news conference after the speech, he said the statements could be prepared with input from business groups like chambers of commerce or the Colorado Association of Commerce and Industry. Those groups already routinely lobby for or against bills. “This doesn’t mean we compromise our standards or put our land, air or water at risk, but it does mean that we’ll keep a fierce and even relentless focus on jobs,” he said during the speech. But Hickenlooper didn’t leave Democrats hanging. He told the Legislature it should keep a fee on hospitals, which Ritter created to fund health coverage for the poor. House Republicans have introduced a bill to repeal it. Hickenlooper also said he wants his budget office to prepare multiyear budgets for the state. Most businesses have a five-year plan, he said, while the Legislature plans one year at a time. Beyond the few specific proposals, Hickenlooper’s speech was all about setting an expectation that elected officials will get along. However, the address had sparse details about the billion-dollar question – what the Legislature should cut from its budget and what it should protect. Sen. Ellen Roberts, R-Durango, talked briefly with Hickenlooper after the speech about the lack of specifics. “He mentioned that it was intentional on his part. You’re not having a meaningful dialogue if those decisions have been made,” Roberts said. Roberts was one of six legislators who escorted Hickenlooper from his new office into the chamber, and she sat behind Hickenlooper during the address. “I’m encouraged. It was the kind of things I wanted to hear and people in my district wanted to hear – a focus on jobs and the economy,” Roberts said. The main initiative in the new administration is a drive to write economic plans for all 64 counties. Hickenlooper said he wants “a bottom-up, community-based initiative” to see what works for each county, and he asked all Coloradans for advice. The first meetings begin this week, with a La Plata County gathering at 10 a.m. Saturday at the Strater Hotel in Durango. Meetings for Montezuma County and the other Southwest Colorado counties have not been announced. “We need everybody in this room, everybody who is listening to this speech, every state employee, every farmer, every rancher, every small-business owner and every worker across the entire state of Colorado to decide that we need each other, and we are going to pull together in these hard times,” Hickenlooper said.